I used the lid off a barrel and set it in the cob around the core and exhaust area. A little clay slip seals the barrel to the lid. You are just an endless source of referencing off the wall cool ideas. Do you have a 6" J tube? The feed looks that big, as does the exhaust. I was thinking you had built it with a ~4.5" core. Adding something to pull some more heat off the exhaust before it goes out the window would boost the heat output. 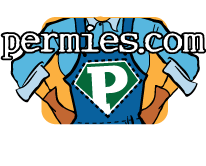 Welcome to the permies forum Mike. You have a rather cool and simple looking design. I hope you don't expect much heat output from it though. Well, I'm not sure where to start. Really need some more details. It looks like you have a 4.5" core, but the duct looks like 6". But right off I see no 4th side (next to barrel) for the feed tube. General dimensions of the "J" look workable. Did you do a test burn with no barrel? What is the barrel gap from top of riser? When you say it's not hot, do you have a temp reading? Does it seem to draw weak (smoke back) at the feed tube? Is the final exhaust smokey or clean? I can help solve your problem, but need more info. Erica, Thanks so much for starting this thread. I saw a video of Paul Wheaton's where he said one of the top questions he gets about RMH's was how to heat water for aquaponics. I'm amazed that it hasn't been worked out to a simple set of options of basic designs yet. Although I guess everybody who builds a RMH does so with their own personal twist. Such appears to be the case with heating water as well. Since I'm a highly technical guy I enjoy delving into all the possibilities of this subject. Consider this, all electricity plants (with the exception of hydroelectric) produce electricity by first converting heat from either burning coal, natural gas or nuclear reaction into steam which powers turbines that turn generators. First basic point I think everyone should understand is that what we're talking about here is using the highly efficient nature of a rocket heater and using the heat energy produced by burning wood into heating all manner of other substances like air, cob, and water. As such we are limited by the amount of energy contained in the fuel used and the rate and efficiency at which it can be converted to heat. How we want to divide that heat output between space heating and water heating for consumption or simply water heating (like an aquaponics fish tank or thermal mass) will determine the methods used. So if for example we have an 8" RMH and it might be capable of producing for purposes of this discussion say 50K BTU's/hr (a bit of a guess). If we are going to split that heat output up between radiant heat off the barrel, heat absorbed by a thermal mass, AND heating water, we need to understand the limitations that presents. Mainly the amount of BTU's /hr you'll need to heat the space and store for later radiation will limit the amount of heat that can be put into the water. Further the point of heat extraction for the water can affect the space heating output. As Erica has said expressing ideas at 3-5am may get a bit foggy, so I'll let this simmer for a while and add to it later. I really liked ZFF's concept, and it was very inspirational in my 1st rocket heater plans. He did some posting here about his original build and testing. The only aspect I questioned was his lack of burn tube insulation (other than it being made of fire brick). It is a nice design that has been working well for him. I see no reason not to use his ideas with our own added touch. He did use refractory cement (in a tube I believe) to hold everything together, at least for the riser anyway. 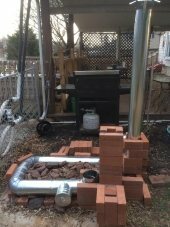 I tried that in my first build, but since I stacked my bricks incorrectly it didn't hold up. If you haven't seen this you should check it out. It's Zero Fossil Fuels rocket heater and is almost exactly like yours. He has links to the plans and several detailed youtube videos on build and use. Joe-I suppose that measurements of your J-tube would clarify, but looking at your pics I'd say your riser needs to be taller. Alan Wright wrote: We've got 50' with an 8 inch system. We use an in-line fan to get it going and then once its warm she runs good, except when the wind blows hard. I know its "cheating" but we love the in-line fan, takes all the difficulty out of it. While having an inline fan obviously helps with draw, if anybody decides to use one it shouldn't simply be put directly inline of the exhaust unless it's being run all the time. When it's not running it will slow/restrict the exhaust flow. There is scant discussion of an inline fan's proper placement as it's regular use is not generally recommended. Dan- First step is to figure what your heating needs (BTU's/hr) are going to be, then size your system accordingly. Here is a general formula to get you started. A/R x ^T=BTU's/hr. A=surface area of space (walls, roof/ceiling) R= "R" factor of the walls/ceiling, and ^T(delta T)= temp difference outside to inside (worst case like 0deg Out to 70deg in). Since what you have in the space is also a factor this is just a place to start. Your needs will determine if you should use a 6", 8" or bigger J-tube system. Length of duct, size/type of thermal mass, are next factors to figure to get maximum heat extraction.